This Thursday, Nov. 2, 2017 photo provided by the Auburn Police Department shows the wreckage of a truck carrying beehives after a crash on Interstate 80 in Auburn, Calif., north of Sacramento in Northern California. 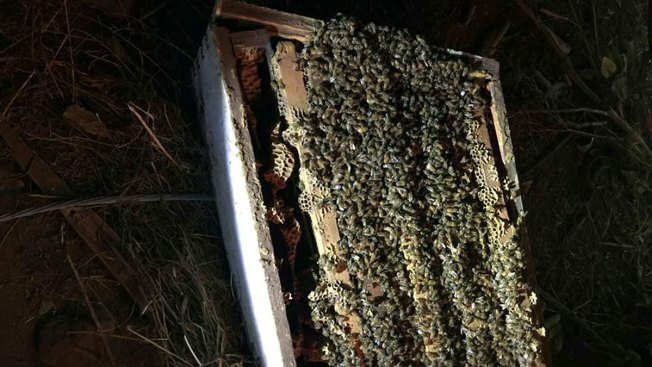 About 1 million bees have been killed after a truck carrying their hives crashed in Northern California. Authorities say the big rig swerved off Interstate 80 Thursday night in Auburn, north of Sacramento, as the driver tried to avoid hitting slowed cars. The truck crashed into an embankment. The driver escaped with minor injuries. However, authorities were forced to kill the bees by spraying them with soapy water after beekeepers determined that the hives couldn't be salvaged and rain was expected. Beekeeper Nathan Smith tells KTXL-TV that the bees were being transported from Montana to California's Central Valley to pollinate almond trees and were valued at $1 million or more.